One of the titles on my summer reading list is Empowering Learners: Guidelines for School Library Media Programs (AASL, 2009). I had purchased the book when it was released and skimmed it many times. This summer my goal was to read and reflect upon its ideas and develop some sort of action plan for implementation. Of all the ideas in this book, the idea that struck my greatest was the five roles of the library media specialist. I was surprised to see that the number one role of the SLMS is that of a leader. What follows are my reflections of how I have evolved in that role across the span of my career. Being a leader is a challenge for someone who is a committee of one in her school. It is especially a challenge for a 23 year-old who lacks experience in the world of education. When I took my first job I didn’t express my opinions on education. I really didn’t have any. After I had my baby two years later, I became a better teacher, but I remained very deferential in the patriarchal school in which I was employed. In my next teaching job I felt bullied by the hostile forces around me. I was hired as a planning period teacher, but I did not understand that at the time. 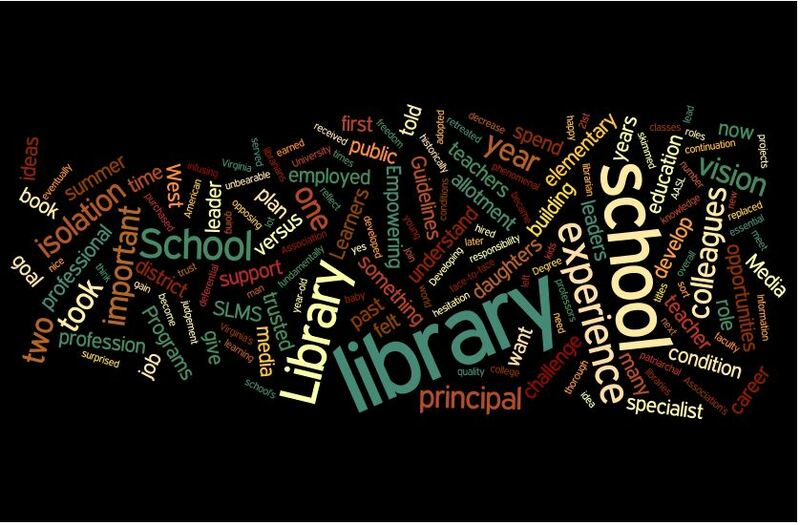 I did not understand how building a quality library could not be important to the teachers who were not willing to give up the very meager library allotment that they had historically spent because there was no library or librarian prior to my being employed. The principal was a very nice man who told me, yes, I could spend the allotment. He told the classroom teachers they could spend the same money I had already encumbered. After a year and a quarter of unbearable isolation and tension, I retreated to the public library, where I was nurtured and encouraged. I took on many special projects and most importantly earned my Masters in Library and Information from the University of South Carolina. Though I never stepped foot on campus, I believe I felt more rapport with my professors and colleagues through this early distance learning experience than I ever did in face-to-face college classes. The support and encouragement I received during this time is fundamentally important to the professional I am today. Degree in hand, I left the public library and took a position as the library media specialist in my daughters’ elementary school. The principal was phenomenal and handed me the responsibility of building both our school’s library and technology program. I put in a lot of hours, but I developed a plan and vision for what our students should have. The happy faculty at this school trusted my judgement and adopted new measures even with hesitation. My daughters are now 29 and 26, but I am still in the same elementary. The principal retired and was replaced by two other wonderful administrators who both empowered me and trusted my vision. I have grown tremendously under their guidance. I think overall these stories of my career have two tracks of opposing conditions that contrast young me from the 55 year old that is writing for you now. The first, less imposing condition is inexperience versus experience. No one can help you gain experience but yourself. The second, more important condition, isolation versus nurture, is something I can do something about. I can lead and be supportive of our younger colleagues and give them opportunities to grow and eventually become leaders in my district. Developing leaders is essential for the continuation of our profession. My goal is to decrease the isolation and develop a sense of importance in each LMS I meet. Not only do I want them to feel secure in their jobs, I want them to trust their visions on a national agenda for school libraries. Our kids are going to need strong librarians to support their rights to intellectual freedom. For the past year I have served as chair of the West Virginia Library Association’s School Library Division. In this capacity I have had the opportunity to reach beyond my district. I am anxious to form coalitions with my colleagues to strengthen the school library programs for all West Virginia’s children. A huge lesson I have learned over the past 30 years is that I cannot accomplish my vision on my own. Empowering Learners: Guidelines for School Library Media Programs. Chicago, IL: American Association of School Librarians, 2009. Print.